Haven’t you hear the phrase “It’s better to prevent than to lament”? Don’t wait for a problem to be big enough for you to take action and try to solve it, it’s better to develop a system that let us prevent all kind of problems in our lives. I’m referring to constantly do an introspection in ourselves of how we are growing towards the kind of person we desire to be. This is call self-awareness, and it present in our life when we can step outside our own mind to examine our thinking and behavior, as a way to understand what’s working and what isn’t. 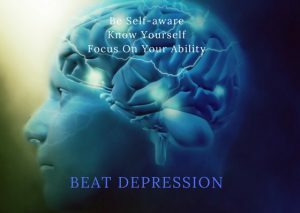 With self-awareness, you’ll see why you are experiencing life as you are, and from there can make better decisions on the best way to proceed to solve any situation, like depression and anxiety. 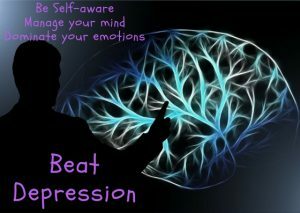 Self-Awareness Reduce or Increase Anxiety and Depression? To that question, I would say that absolutely helps you to reduce the effects of depression, not to increase it. There’s a confusion between self-indulgence and self-awareness. The former is being judgemental about your way of doing things with the mean to protect your ego. The latter is non-judgmental, is doing introspection without your ego to better understand why you’re doing what you’re doing now. When you are self-aware of your behavior, you’re in a good place to start changing what’s wrong and you can acknowledge what’s right in it. By no means, I’m telling you that just with self-awareness you can cure depression when you just want to curl in a fetal position on your bed. But remember that first step of solving a problem is to acknowledge there is a problem. Every time you make the hard decision on getting from the bed, every time you call a friend to talk, every time you try to know yourself better, you’re becoming a little bit more self-aware. For making huge steps on developing self-awareness you need to make your own journey of exploring your self-worth, self-acceptance, and self-confidence. What do I think about myself? What do I want to accomplish in this world? Your life gets so much better when you align your behavior with your dreams. No doubt about it. Once you become more self-aware you’ll have the wisdom to solve any kind of problem in your life. This is key if you want to reduce and beat depression from its core. This is how you learn to manage your emotions and become charismatic, self-confident, and joyful. This is the kind of people that seem to not be disturbed by anything or anyone. It is like life is served on a silver plate to them. Because they really know! So glad that it helped you a lot and you find it useful! This means a lot to me too. Thank you for your comment.